Here’s hoping everyone had a great Thanksgiving! 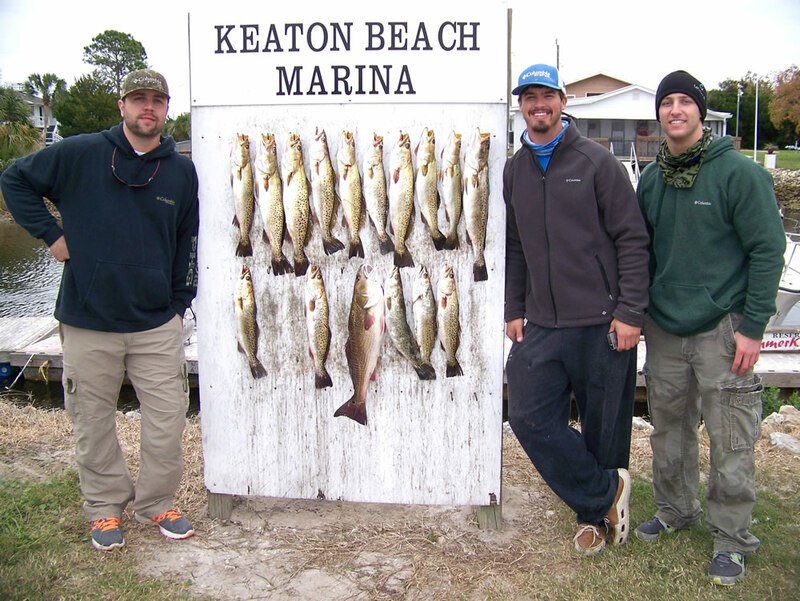 As always this time of year, the weather played a major role, but the fishing was excellent as many braved the winds and occasional rain and made some great catches. 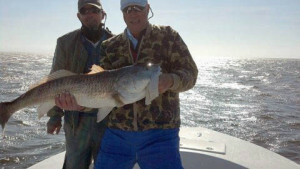 Bull reds were plentiful nearshore, along with literally buckets of silver trout. 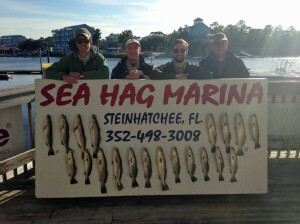 There were some excellent flounder and sea trout, and bluefish and large Spanish mackerel kept the inshore fishermen busy, while the gag and kingfish bite was excellent offshore. 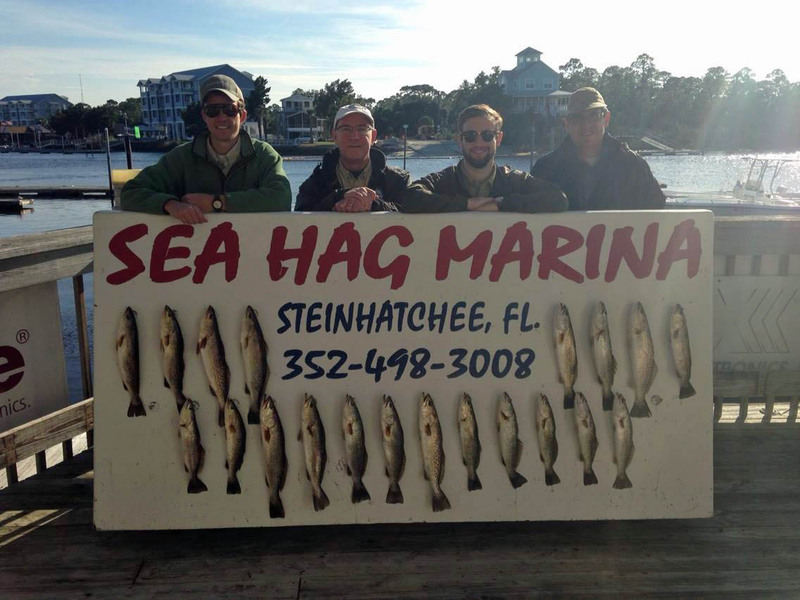 Near the end of the month, even before a major cold snap, some large sea trout were caught trolling MirrOlures in the Steinhatchee River. 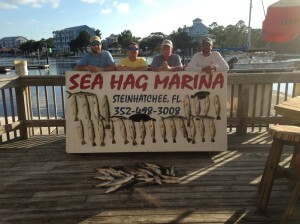 Some major news from the Sea Hag….we have expanded our excellent quality marina services to the Keaton Beach Marina, now known as Sea Hag at Keaton Beach. 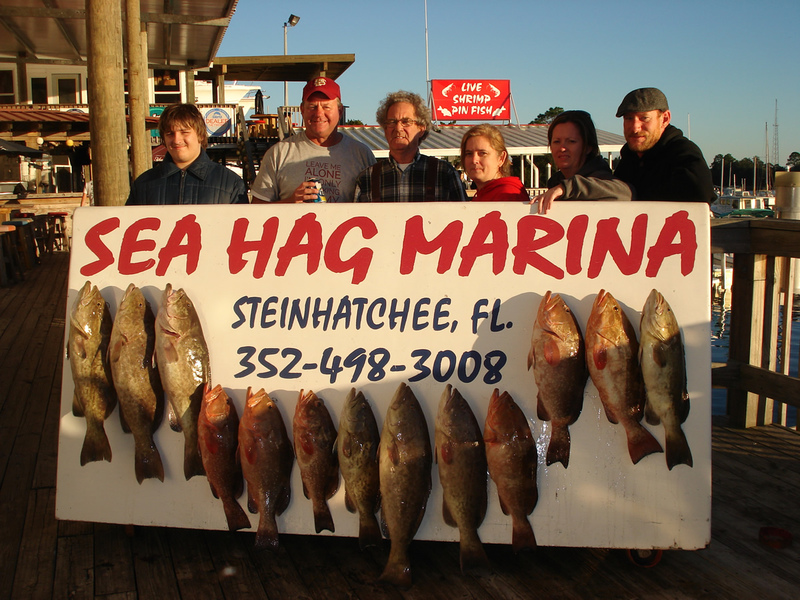 The marina now provides ethanol-free gas, ice, live shrimp and pinfish, frozen bait and chum, motel rooms, and a full supply of apparel (and as a special surprise, a female boat lift team). 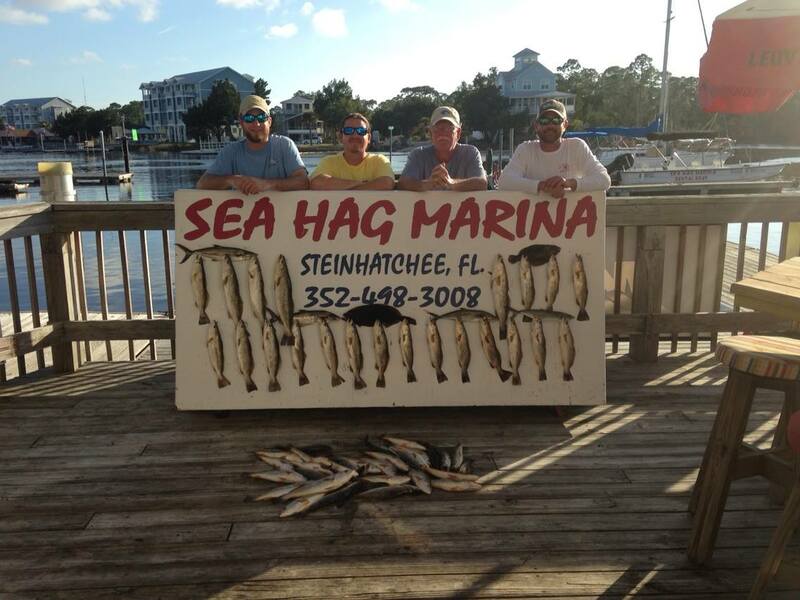 For those of you fishing the Keaton Beach area, stop by and say hello to the new staff and take advantage of the excellent service you have come to expect in Steinhatchee. And another draw….the hot dog stand is open under new management. Come see us at Keaton. 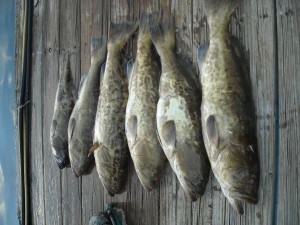 Now, some pics from this month’s catches. 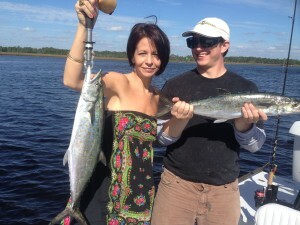 Had the opportunity to take my son Sid and his girlfriend Lee out to score some big Spanish mackerel. 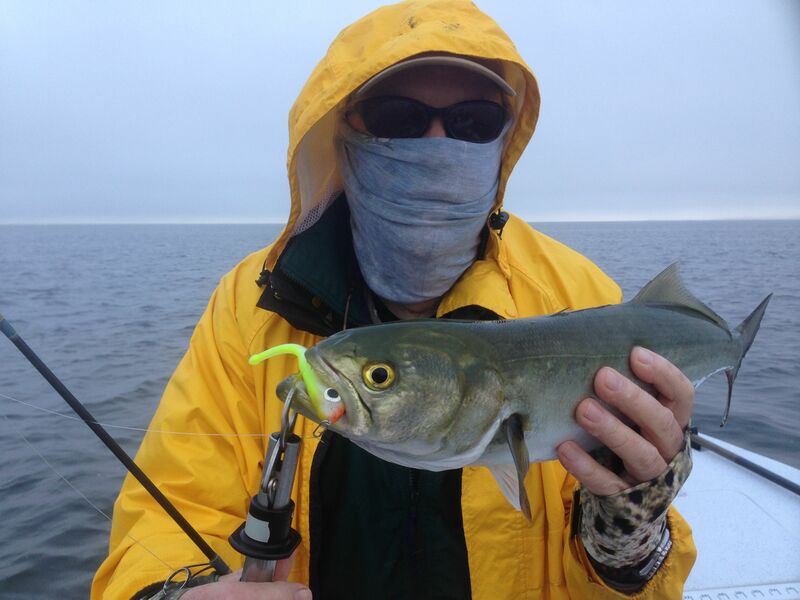 We ran into acres of bluefish, which were a blast on fly. 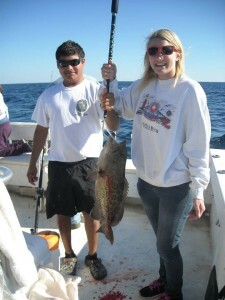 We also found large numbers of black sea bass in 8 feet of water. 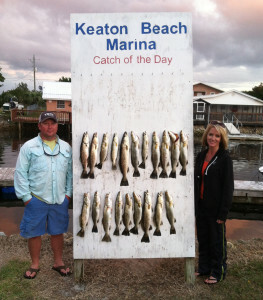 From Keaton Beach: David Sills and Melissa Meyer , fishing with two friends, scored this great bunch of sea trout. 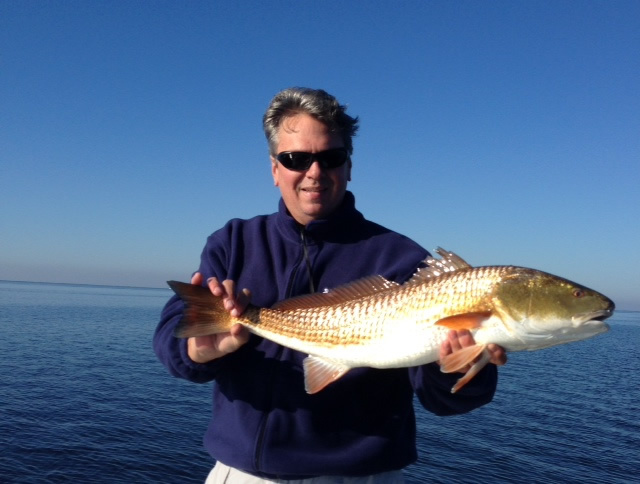 More bull redfish, this one nailed by Scott Rauch. 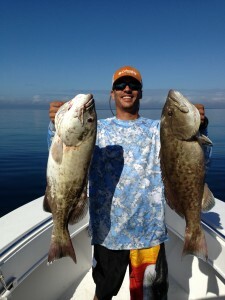 Mike King and a fine gag grouper. Miguel Parga and a beautiful pair of gag grouper. Robert Hobbs and Tommy Ballard with some gators. David Matthews, Hal Chambers and Jim Letourneau got these fine trout at Keaton fishing the old-fashioned way: shiner tails under corks. Junior Captain Chase Norwood found this gator trout trolling a Mirrolure in the Steinhatchee River. 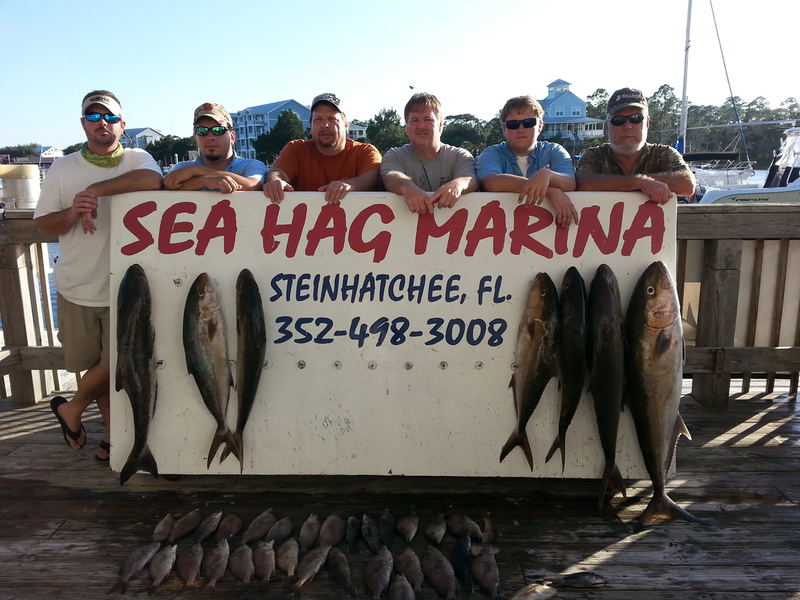 And the amberjack were still available, along with some cobia. This fine catch was by the Bradfords, the Davis family and Ricky Stevens from Lake Park and Valdosta. Miguel Parga didn’t stick to grouper; he also found this giant bull red. Unfortunately gag group season closes on Dec. 3, but red grouper and amberjack are still plentiful, along with kingfish, Florida snapper and black sea bass for the offshore fishing trips this month. Much of the inshore fishing will be in deep holes and especially the Steinhatchee River for sea trout. 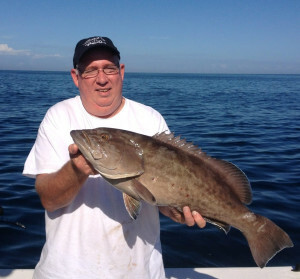 Anchoring just outside the channel and casting into the deeper water with live shrimp or Gulp baits with split shots and letting the current carry your baits is the standard way of fishing, but casting sinking plugs such as the Mirrolure 52M or even trolling slowly through fishy areas can be productive. On your bottom machine, you will see a lot of fish in the river. 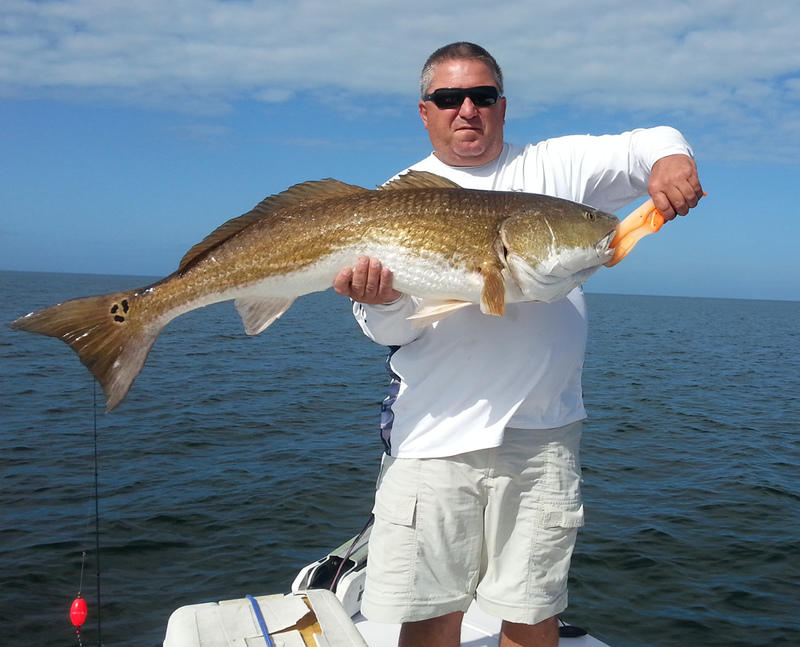 Smaller croakers, black drum and redfish will be very near the bottom. Trout and mullet will be swimming more in mid-depth. Please be courteous of other anglers and boaters by staying out of the channel and keeping some distance between you and others. 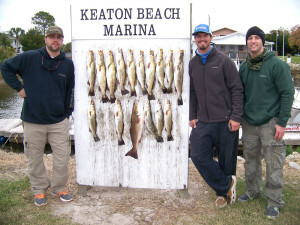 There will be plenty of keeper trout to be had. 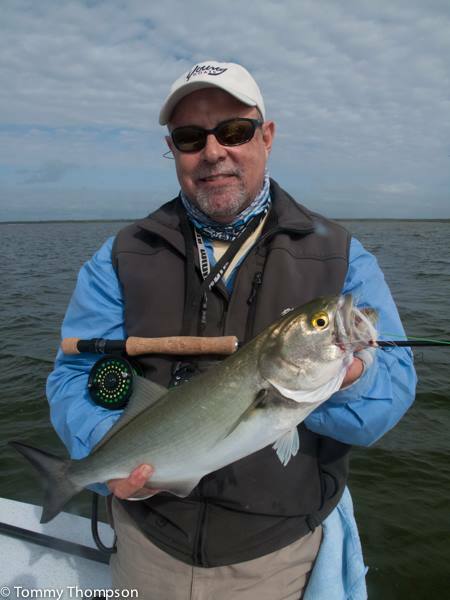 When trout are in the river, they are constantly moving with the current, so if you catch several and then the bite slows down, that usually just means a school has moved on. 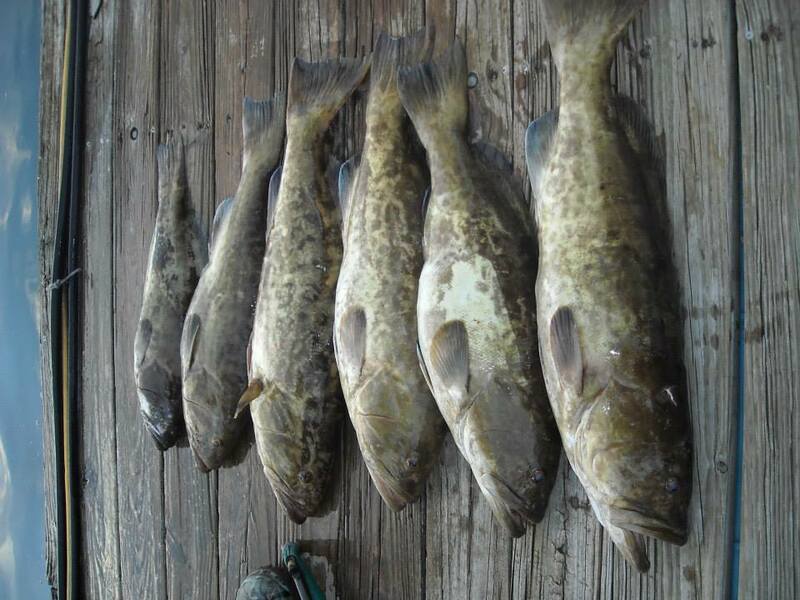 Another will likely appear, so moving around a lot generally doesn’t help your catch rate. When you first arrive, do pay attention to other boats, and if nobody is catching anything, don’t hesitate to move at those times. 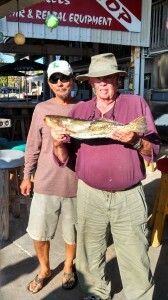 And remember that some very large trout have been caught way upriver in very cold water; a friend caught the largest trout he has ever caught at Steinhatchee, over 31 inches, at the power lines, way upriver from the bridge. 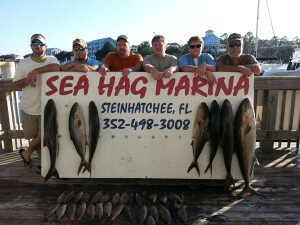 You can always give the marina a call to keep up with the latest bite, and remember that we supply excellent rental boats at a very reasonable price, along with live bait, tackle, plugs and even rods and reels and accommodations to make your trip an easy one. 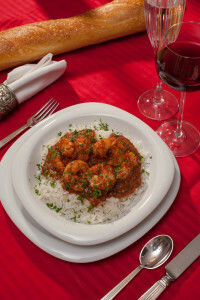 Come see us….and have a wonderful holiday season! And now some pictures from some of our excellent guides…. 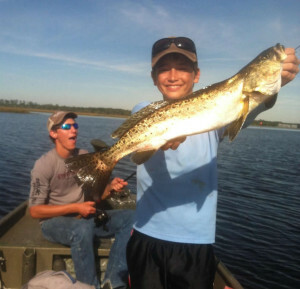 While trout can be found in the river, your best bet to catch limits is to hire a guide. 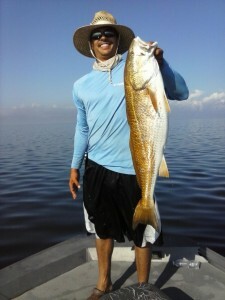 The better numbers are on the deep flats as well as redfish. The Spanish action slowed with the last cold front but should improve as the water continues to warm. Still catching nice limits of trout with some redfish and flounder mixed in. 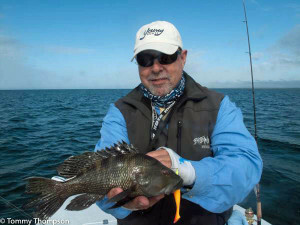 Sea bass are starting to show around the hard bottom areas. 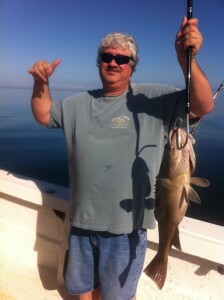 Days are open for charter. As I write, mid November, two cold fronts have passed over and another is expected this coming weekend. 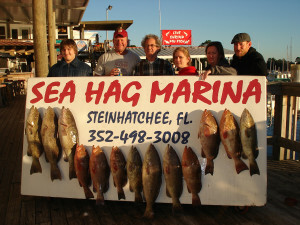 Seas have been too nasty to go offshore for approximately two weeks. It seems December will bring some strong weather, if things keep going the way they are. On the sunny side, there has already been one movement of trout in the Steinhatchee River. First time in a while trout have moved in so early. 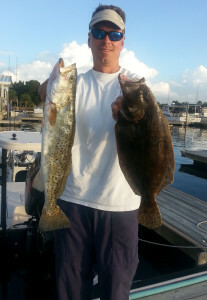 The typical baits, Mirrolures, jigs and shrimp are taking the fish. If you don’t know where to go, just look for the boats. Remember courtesy is contagious; good fishermen practice good etiquette. December is the start of the sea bass run. Kids of all ages can speed catch big sea bass on most any piece of hard bottom from 20-45’ deep. 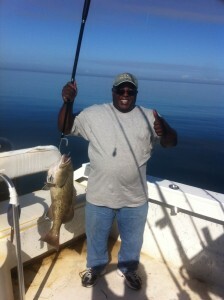 The catching is so fast I call it “yo-yo” fishing. Sea bass are one of the tastiest fish in the sea. Remember, the largest fish will normally hit first so change locations once the fish become consistently too small to keep. 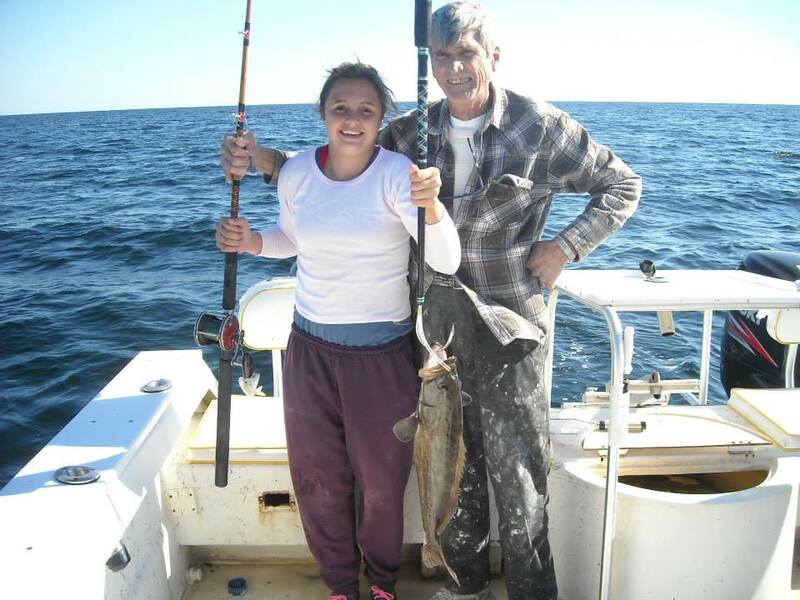 On a winters bluebird day, a combo trout and sea bass fishing trip is a great way to stave off cabin fever. Thanks for reading and a merry Christmas to all! 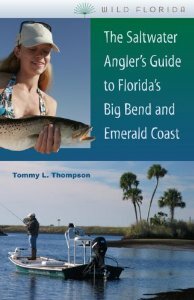 If you’re looking for the perfect holiday gift for a fisherman friend (or for yourself), consider buying a copy of my book, The Saltwater Angler’s Guide to Florida’s Big Bend and Emerald Coast. 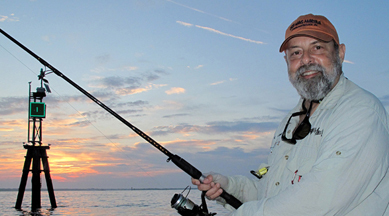 The book covers all the waters from Homosassa to Pensacola and offers insight into local fishing, as well as lodging, marine facilities and dining. They’re available at the Sea Hag’s Ship’s Store. 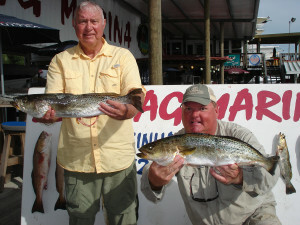 And don’t forget to read my “Sportsman’s Kitchen” column in your monthly copy of Florida Sportsman magazine. The December 2013 issue features a recipe for Shrimp Creole that will make everyone in your house happy!